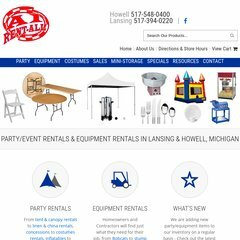 Topics: Party Rentals, Equipment Rentals, Used Equipment, Coupons, Forms/guides, and Lansing Mi. The estimated 23 daily visitors, each view 8.00 pages on average. Rackspace Hosting Texas is the location of the Microsoft-IIS/6 server. There are 5 DNS records, such as dns2.name-services.com, dns5.name-services.com, and dns4.name-services.com. The site is programmed for ASP.NET. PING www. (174.143.34.90) 56(84) bytes of data. A ping to the server is timed at 35.6 ms.